Our frequently asked questions are updated on a regular basis. Do you have a question not listed here? Call us at 1-866-953-4769 or complete our contact us form. Knowledge Bureau courses are web-based and will function on any type of computer. Some courses use 3rd party professional tax and bookkeeping software, which will only work on a PC. Learn in the comfort of home or office by self-study. Tax deductible tuition; everything included; money back guarantee. For more information and to enroll visit our designations page or call for a free personal consultation 1-866-953-4769. Are you completely comfortable with your ability to provide the knowledge-based services your clients require to achieve peace of mind in their tax and financial planning needs? If not, you have come to the right place for solutions. Alternatively, if you are ready for a career change and the tax and financial services appeal to you, you should look further into the flexible self-study programming offered by The Knowledge Bureau. What is the Distinguished Financial Advisor and Master Financial Advisor program? The MFA and DFA-Specialist designations identify a select group of advisors who have successfully completed a program of advanced studies in the financial services industry. The programs available through Knowledge Bureau lead to specialization in retirement income planning, tax preparation services, bookkeeping services, investment planning services and coming soon: succession and estate planning services and personal financial planning. Students have a maximum of 3 months to complete a course, 18 months to complete the MFA or DFA-Specialist Designation Program. Depending on your background, experience, and knowledge, an individual course could be completed in a shorter period of time. Extension requests are possible too. Who is an MFA - Master Financial Advisor? MFA graduates have taken their knowledge and experience working with clients to a strategic level to develop outcomes that steward family wealth from one generation to the next. The MFA Designation Program is a post-graduate, post-licensing program of studies. MFAs possess the knowledge and skills required to work as quarterbacks and/or specialists on an inter-advisory team focused on providing Real Wealth Management™ services: the accumulation, growth, preservation and transition of wealth on an after-tax, after-cost and after-inflation basis. This team's job is to identify, isolate and eliminate any possible threats to a client's income, family and personal security, retirement peace of mind, legacy and lifestyle. Their coordinated efforts provide significantly better advice and results for the client. Any one of these players can be the quarterback of the client's financial team but they have to have the skills to take command of the group, overseeing the decisions made together with the client. In many cases that quarterback is the accountant; in others, the Investment Advisor takes charge, but anyone of them, trained as an MFA, could serve that role for any given client. Working together with the family in managing real wealth, the MFA oversees changes in the family's net worth with a strategic plan for decision-making that focuses on goals, targets and results on a periodic basis. 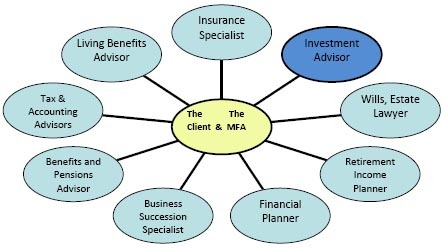 The role of the MFA includes presiding over the activities of the client's professional team of advisors to ensure outcomes are well coordinated, simplified, and produce the results everyone wants. The MFA requires the professional to adhere to the highest standards of excellence in service. Participants in the program are expected to adhere to the compliance, ethics, regulatory and education requirements of their respective professional associations and organizations. What distinguishes a DFA/MFA designate? The manner in which preparedness meets opportunity. . . Position yourself and your firm as a leading professional service provider to the baby boom generation, their parents and their children. This demographic presents the most significant business growth opportunity for professional advisors since the tech bubble. It has the potential to enjoy unprecedented real wealth now and for generations to come, but only with savvy stewardship: careful attention to after-tax wealth accumulation and ongoing capital preservation. But there is even more to real wealth management than that. A certified and designated Distinguished Advisor also understands the complicated dynamics that precede financial decision-making: what's important to the client and why. As many clients looking for the right tax and financial advisors tell us: "Before I will pay for help, I need my financial advisor to 'get me'". That's why it is so important to learn more about the development of client-centric practices and the nuances in working within an inter-advisory professional team. In short, financial advisors face a complicated set of hard and soft issues for sophisticated clients within a volatile marketplace, both of which affect the path to the right tax and investment solutions. For that reason we urge you to consider joining the ranks of other prominent advisors nationwide by earning your Distinguished Financial Advisor designation in the tax or bookkeeping services and your MFA (Master Financial Advisor) designation in the financial services. Are my tuition fees tax deductible? Knowledge Bureau is a private, designated educational institute and our tuition fees qualify for the Tuition Fee Tax Credit if over $100. This includes the fees for all self-study courses, the Distinguished Advisor Workshops and the Distinguished Advisor Conference™ (DAC). To claim the deduction on your tax return, you’ll need a completed Form T2202A Tuition, Education and Textbook Amounts Certificate. For more information, visit our Tuition Fee Deductibility section. Who is a Distinguished Financial Advisor? Distinguished Financial Advisor graduates have taken their knowledge and experience in tax planning, bookkeeping and business services to the highest professional level. The Distinguished Financial Advisor is positioned as a master of documentation and record keeping and a tax-astute financial analyst and consultant to clients and owner-managers. The Distinguished Financial Advisor Designation Program is a post-graduate, post-licensing program of studies. Distinguished Financial Advisors possess the knowledge and skills required to work as professionals called upon to provide current, accurate for tax authorities, business owners, and other regulatory agencies. The Distinguished Financial Advisor requires the professional to adhere to the highest standards of excellence in service. Participants in the program are expected to adhere to the compliance, ethics, regulatory and education requirements of their respective professional associations and organizations. Can I use the DFA-Specialist or MFA behind my name? These voluntary designations are conferred upon successful graduates who meet program requirements. Successful graduates are granted the rights to use the designation by Knowledge Bureau on their letterhead and business cards after receiving an official Certificate of Distinction, which signifies their accomplishments to their clients. Standards of Conduct must also be met, as well as ongoing continuing education through one of The Knowledge Bureau's Workshops or Distinguished Advisor Conference. Why study with Knowledge Bureau? Training is focused on developing skill sets that are directly applicable to day to day work. Content is current and practical work is case-study based, with true-to-life scenarios, challenging even for seasoned staff. Tuition fees qualify for the tuition credit and include all books, assignments and instruction. 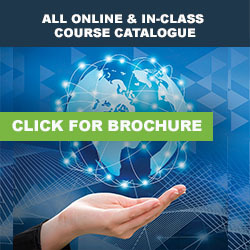 Courses feature the latest technology and programs from leading suppliers. Assignments are leading-edge, online multi-media applications, available 24 hours a day, 7 days a week and fit any schedule. A complimentary subscription to EverGreen Explanatory Notes, our ever-current online resource for answers to tax questions about personal and corporate tax and the GST, provide enrolled students with the sleekest gateway to information from The Knowledge Bureau, CRA and Finance. A Fast Track study option is available. Save time and training resources by enrolling students in comprehensive and complete training that features both a self-study component, and a classroom week. A student can complete a Distinguished Financial Advisor designation program in six months using this track; and become an expert in tax preparation or advanced bookkeeping for an entire business lifecycle; the same on-the-job-training training would consume years for both the student and the senior staff member. Continuing education credits are available for all courses. Course packaging may be branded, co-branded or private labelled at your option. Certification, examination and accreditation are included. So is personal online help for student support. Regional workshops and national conferencing are available to stimulate thought and provide networking opportunities. Knowledge Bureau was established in 2003 to serve the need to train tax and financial advisors who are prepared to specialize in complex tax, retirement and investment planning services within an inter-advisory environment. We provide our students, who are largely experienced practicing advisors in tax, accounting or bookkeeping, investment, insurance or financial planning practices, the opportunity to deepen knowledge, train new and returning staff, expand their practice models with new procedures and tools and find support related to changes in tax and the economy. We are certified by Human Resources Development Canada (HRDC) as a designated educational institute. This means our tuition fees may be claimed on your Canadian income tax return as a tuitioncredit. To achieve this designation as a certified educational institute requires a vigorous approval process involving permissions from provincial departments of education across Canada and the CRA. Note fees for attending the Distinguished Advisor Conference may be subject to different rules for deductibility. Please see IT-357 . Courses at The Knowledge Bureau have also been recognized and/or accredited where required by a number of professional organizations and accrediting bodies in the tax, accounting and financial services including Advocis, the Investment Dealers Association, numerous insurance councils and the Financial Planning Standards Council. Refer to the accreditation section for details. You can begin anytime throughout the year at your convenience, and save money on tuition fees by enrolling within one of four sessional deadlines during the year. Please see our Fee Structure for more information. How can I learn more about detailed course descriptions? Browse our selection online, view our course catalogue, or call 1-866-953-4769 for personal assistance. Is the program available by group study? Yes, contact us at 1-866-953-4769 for information about group study in office, over the web or at Knowledge Bureau Conferences or Education days. Self-study courses allow you to begin anytime throughout the year and learn in the comfort and convenience of your own home or office, completely supported on a one-on-one basis with our instructors. These programs are the first designations to be delivered in a three-dimensional self-study learning environment. Complete your continuing education requirements using your preferred teaching medium - audio, reference book and skill-testing Internet applications. Tax deductible fees include all books, online instruction, student support, certification and accreditation. The Knowledge Net: access to a personal website which provides questions, interactive answers, case studies and practice management tools. 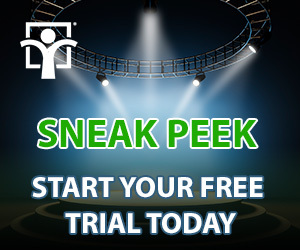 It includes some of the industry's most cutting edge software, simulations and management tools like client interview checklists, tip sheets, and high-value resources from leading product suppliers like student versions of tax preparation and accounting programs. BONUS: All courses include access to The Knowledge Bureau’s EverGreen Explanatory Notes, the powerful, ever-current online resource for answers to your tax questions about personal and corporate tax and GST. Is there an exam and where do I take it? Yes, there is a final exam. It is taken online in the comfort of your own home or office and is an open-book test. There is no extra charge to take the examination for each course. Rewrite opportunities are possible if required. What are the requirements for Designation program entry? Are there early registration or volume discounts? Students who commit to a long term study plan (more than 1 course) within a sessional enrolment period, save money on tuition fees. Also, those who have taken a Knowledge Bureau program in the past year (Workshop, Conference or Self-Study Course) qualify for our affinity program and may identify themselves as a "preferred client." Volume discounts are also applied to offices training multiple staff members in the same or a variety of courses. See our Registration and tuition section for more information. Please see our policies section for more information on refunds, shipping, guarantees, and other information about our policies. How many CE credits can I earn? The Knowledge Bureau is accredited with various professional organizations in the tax and financial services industry. Full details are included in the accreditation section. Your successful completion will be confirmed by your achievement summary online and by email. You can then forward your achievement summary to your professional organization or regulator for CE credits. You will also be sent a handsome Certificate of Achievement or Distinction from The Knowledge Bureau. Why am I receiving a NaN in my calculator? This may be due to a plugin installed in your Internet Browser. Try to disable current plug-ins to isolate to which plugin may be causing the conflict. This has been reported to occur with IE11 on Windows 7.